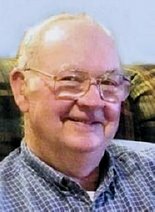 John “Jack” Bailiff, age 82, of La Porte City, died Monday, February 23, 2015, at the University of Iowa Hospitals and Clinics in Iowa City. He was born July 15, 1932, in rural Adams County, near Corning, Iowa, the son of Charles “Ross” and Clara (Reed) Bailiff. Jack was united in marriage with Joyce A. Johnston on June 29, 1952, in Corning, Iowa. He was a US Army Veteran. Jack was an Ag Technology instructor at Hawkeye Community College in Waterloo for 31 years, retiring in 1997. He formerly operated a John Deere Implement dealership in Corning, Iowa, worked for the Corning Community School District and served on the Corning Fire Department. Jack was a member of St. Paul United Methodist Church in La Porte City. Jack loved to teach, enjoyed tinkering with motors and other equipment and was a gifted small engine repairman. He collected B.B. guns, enjoyed attending auctions, and was fond of stock car racing and hunting. Survivors include his wife, Joyce of La Porte City; his four children, Barbea McCrary of Portsmouth, Virginia, Jerry (Ranelle) Bailiff of Elk Run Heights, Iowa, Judy (Mark) Hora of La Porte City and Julie (Dale) Franzen of Hastings, Minnesota; eight grandchildren, Meg Newsom, Patrick McCrary, Erica Burger, Candi Yoder, Brandy Hora, Neil Hora, Matthew Franzen and Kelly Franzen; 14 great-grandchildren; a sister, Rosemary Teel of Columbus, Missouri, and a brother, Nicholas (Sheila) Bailiff of Prescott, Iowa, and numerous nieces and nephews. Jack was preceded in death by his parents and a sister, Nancy Domonico.